He’s been known to bully kids for not looking “right”. He even had a Michigan State Trooper uniform and a red siren he’d place on top of his white Rambler, impersonating a police officer while in college. His roommates found the whole thing creepy. Recent reports also show he enjoys playing narc on his neighbors on the beaches in front of his multi-million dollar La Jolla spread. But these incidents are just a small dose of the cantankerous character that is Willard Romney. Simply look at the tactics of his attack dog and campaign guru Eric Fehrnstrom. He’s a man who posts unflattering pictures of his opponents while exercising to demean them. Mitt is a regular guest and favorite of Fox News, a network who criticized Secretary of State Hilary Clinton for looking overweight and tired. They claimed she’s “not even trying” (to look like one of their skanky news models). Of course they ignore the fact she has a grueling schedule and has a job of immense importance, unlike their frivolous jobs of spouting drivel and party rhetoric every day. 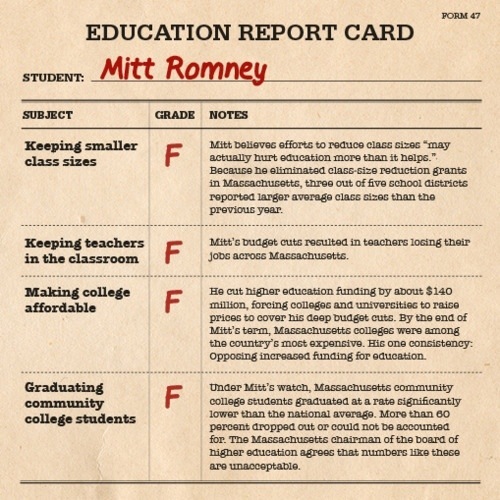 But the worst thing about Romney is how he had nothing but the finest education his family’s fortune could buy, but believes the rest of us should stay stupid. 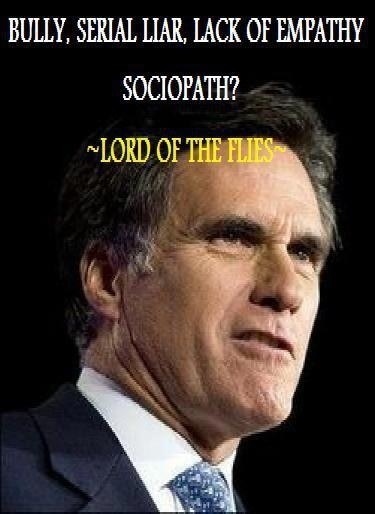 It’s one of Mitt’s 3 S’s: Sick, Scared and Stupid. He already has denounced his own universal health care plan, Romneycare (aka Obamacare), he’s hawkish on increasing our military and insists the Obama administration, with all its foreign policy tribulations isn’t keeping us safe and he’s for drastically cutting education spending and sticking it to poor children. What’s most telling is the position his colleague and Bain Capital Executive Edward Conard who believes the wealthiest 1% aren’t rich enough…. This is one of his Mormon Bain buddies speaking, so you know he’s on the same page as Willard philosophically. Watch this Jon Stewart interview where he demolishes Conard’s greedy garbage. He has absolutely no response when The Daily Show host presents him with real life scenarios of Bain and the like unfairly screwing the working person with a recent account. Romney, Conard, Fehrnstrom and the entire GOP are not concerned with the common man’s plight. If anything, this man, since his days of “hijinks” in high school and college, has only gotten more out of touch and downright vicious to anyone not in his class. He proved this with his abysmal record for job growth at Bain Capital and especially as Governor of Massachusetts as well as his corporate favoritism. This man is a mean-spirited snob who has no business anywhere near the job of governing the nation. He is not for the “common good,” he is only for the good of the 1%, and he’ll show that in very callous and unforgiving ways. His past performance guarantees that. So, we now know what they think the priorities of the Sec of State should be. Yes, make up, hair and wardrobe….kinda like the focus of the McCain campaign on Sarah Palin. See how well that worked out for them. Yes, but Sarah wears bigotry SOOO well. It’s all in how you accessorize.